When properly managed, composting is an effective method for poultry mortality disposal. Many factors, such as temperature, time, and moisture content, affect the composting process. One factor that is crucial to the success of composting is the carbon (C) to nitrogen (N) ratio or C:N. Poultry carcasses have a low C:N of 5, whereas amendments, such as sawdust, can have a C:N higher than 500. Poultry litter, another amendment, has moderate C:N in the range of 7.5 to 15. There is considerable debate about the ideal C:N with recommendations ranging from 8 to 30. What really matters, however, is that the low C:N poultry carcass should be in close contact with higher C:N amendments to allow the aerobic microbes to readily access both C and N.
Values of C:N in materials used for composting can vary widely, and producers may not have information on the C:N of the amendments (e.g., saw dust) they have on their farms. These factors make it difficult for a producer to prepare a compost recipe based on the C:N of materials. Therefore, based on experience and literature review (see Additional Resources below), we propose using simplified recipes for bin composting of routine poultry mortalities. Two recipes for bin composting of routine poultry mortality are proposed in Table 1. Recipe 1 is recommended when mostly high C:N material (e.g., sawdust, straw) is used to build the pile. 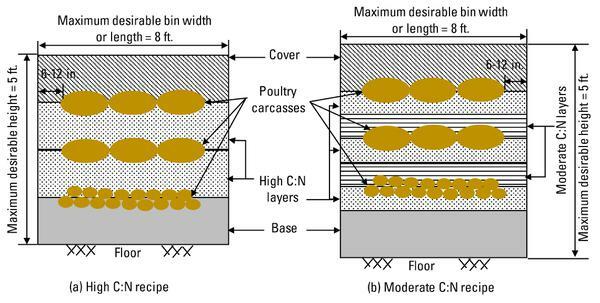 In Recipe 2, moderate C:N material, such as poultry litter and compost, is used in addition to higher C:N material. If other operating conditions (e.g., size of pile, moisture content) are similar, both recipes should be equally effective. Figure 1 illustrates a cross section of the two recipes. Table 1. Recipes for bin composting of routine poultry mortality. place in single layer if more than 6 lb. Figure 1. Recipes for composting poultry mortalities with (a) high C:N and (b) moderate C:N amendments. For details on materials or thickness for specific layers, consult the specific recipes in Table 1. Brodie, H.L., Carr, L.E. 1997. Composting Animal Mortalities on the Farm. Fact Sheet 717. College Park, MD: Maryland Cooperative Extension Service, University of Maryland. Keener, H.M., Elwell, D.L., Monnin, M.J. 2000. Procedures and equations for sizing of structures and windrows for composting animal mortalities. Applied Engineering in Agriculture 16:681-692. McCaskey, T.A. 1994. Dead Bird Composting. Final report submitted to the Soil Conservation Service (Contract USDA-43-2D81-1-561). Washington, DC: USDA-SCS. Rynk, R., van de Kamp, M., Willson, G.B., et al. 1992. On-Farm Composting Handbook, NRAES-54. Ithaca, NY: Plant and Life Science Publishing, Cooperative Extension. USDA – NRCS. 2009. Part 651, Agricultural Waste Management Field Handbook. In National Engineering Handbook. Washington, DC: US Dept. of Agriculture – National Resources Conservation Service. Wilkinson, K. 2006. Mortality Composting: A Review of the Use of Composting for the Disposal of Dead Animals. Victoria, Australia: Department of Primary Industries (DPI).